Meatloaf is one of my favorite comfort foods, and this recipe from my mom is my go-to because it’s ready to serve in no time compared to a traditional meatloaf. Plus, the barbecue sauce is a nice twist on the classic ketchup glaze. And who doesn’t love something made in a muffin tin? In a large bowl, mix together the meat, onion, egg, bread crumbs, and 1½ cups sauce. 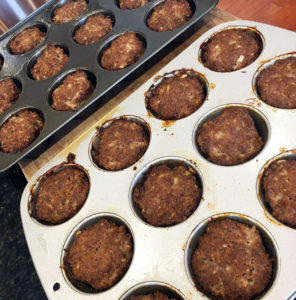 Grease two 12-cup muffin tins. Press ½ cup meat mixture into each cup and top with a spoonful of barbecue sauce. Bake at 450 for 25 minutes. *To freeze: Allow to cool and remove from muffin tin. Place in a foil baking sheet and cover. Defrost and heat to serve.